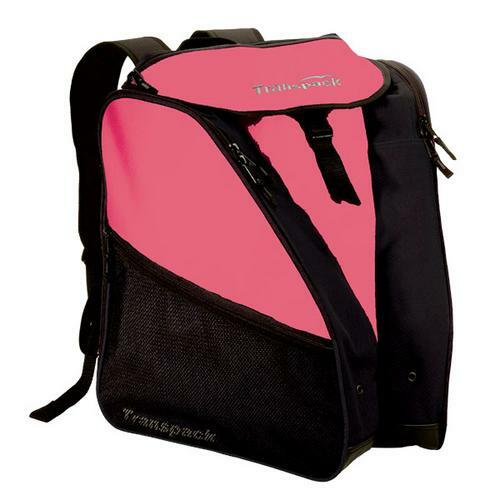 The TRANSPACK XTW backpack is designed, using the Patented Isosceles Storage System which utilizes two side pockets to carry ski/snowboard boots or skates that surround a triangular central compartment that keeps your gear and equipment separate and safe. The Isosceles Storage System diverts the weight and bulk of your boots to your sides and away from your back. This natural suspension makes TRANSPACK backpacks ergonomic and incredibly comfortable to wear which makes this bag one the shop favorites. A large central compartment can hold a helmet and gear. This backpack also features a zippered mesh lid pocket as well as zippered mesh side pockets. Super tough 600 Denier PVC Coated Nylon Polyester fabric and a rubberized bottom make this bag extremely durable in all weather conditions. Extra thick, padded Neoprene shoulder straps, with an adjustable sternum strap, make this one of the most comfortable backpacks on the mountain. - Pink is Floral Pink not just pink as pictured. View other products made by Transpack.